When I was 17, I attended the school for graphical design and printing. I remember one time a teacher yelling at me: ‘With an attitude like that, you won’t get very far in life’. I don’t know why this pops into my mind at the very moment I started to writing this piece for HeroPress. I guess I always wanted to do things my way. I have had pretty strong thoughts about how and why I wanted to do things in life, both personally and work wise. I’ve felt a great love for the DIY and making industry all my life, and was surrounded by people in small alternative ecosystems in my early twenties. Doing printing, music, squatting, cooking… those were the days. After a while, I sort of drifted apart. My career and life seemed to go a different way from what I actually loved. However, I did some small DIY internet projects on the computer that I got halfway through the nineties. I built some blogs and figured out how to do html. I was all on the side though, never professional. Around 2002, I really wanted to go away from what I had and dream, make plans and start a new life. So I ditched my management job, husband and newly built house. With a new love in my life, I bought a 150 year old farmhouse in a rural part of the Netherlands. We were busy doing it up and dreamt about starting our own business someday. Not to depend on a time & place based 9-5 job anymore. In 2007, we started our own webshop in organic gardening and sustainable, handmade garden tools. I experimented with code, Open Source Systems and SEO. I did graphical design, e-mail marketing, text writing, photography… we grew and grew and grew. And then we hit the ground. We got struck by the crisis and everything fell apart. It made me rethink my career and 2011 was the start for me working with WordPress. I had built websites , but never designed a website with a content management system (besides the webshop). I knew WordPress from the dot com blog I had, so after comparing a few systems and asking for advice on Twitter, I decided to have WordPress as a basis for my future work. At the time, I didn’t know what WordPress was. I mean, what WordPress really was. Basically it was the software I chose to work with, but that was that. I spent a lot of time finding out about the plugins, themes and adjusting code and css. But I never knew about the WordPress community that was there, and I wish I had. Although I’ve learned a great deal from my research and mistakes, it would have been so much easier having the supportive community around in the early days of my life as a web designer. It took me quite a while to find out about the WordPress community. I had discovered WordPress support, but never realised these were all hardworking people like me, giving back some time and knowledge to the community without getting paid for it. I guess the anonymity of the internet was part of the reason for me not knowing. At some point I heard about these web developer and design conferences in general, not WordPress specific. It never occurred to me to go there, because I thought I wouldn’t fit in. I didn’t see myself as a real professional, because nearly all my knowledge was self taught. (Later on, I found out that’s the story of nearly everyone I met within the WordPress community). Besides that, designing websites was just part of my job. I also did graphical design, print work, marketing and copywriting. Another reason to feel like a fool among all these smart guys speaking code to each other! Only in 2015 things changed. One of my friends told me about Meetups and was surprised I hadn’t heard of it, since I was her geeky friend. But I had been so busy with keeping my head up after breaking up with my boyfriend, building my company, starting a part time study (I decided to get my bachelor on Media, Information an Communication). In the meantime, I had moved to a new part of the Netherlands again. 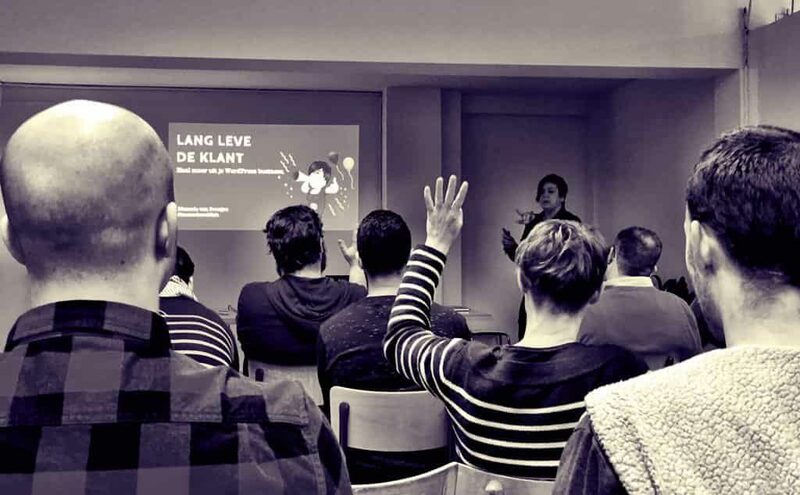 Looking at local Meetups, I found a WordPress Meetup in Rotterdam, approx. 15 minutes by train from where I lived. On a Monday evening, I decided to go there, not knowing anyone attending. I’m not a shy person at all, but sometimes stepping into a new network can be tough, even for extroverts like me. Asking a question at the Rotterdam meetup. Arriving in the pouring rain, I stepped into the elevator bringing me to the right floor. A friendly women called Marleen stepped in with me and we started talking. We had a good click right away and chatted all evening. She then told me I should go to WordCamp Netherlands later on that year, convincing me I would fit in and it wouldn’t be all development and code boys, but all kinds of people like bloggers, marketeers, teachers or entrepreneurs. So October 2015 I went to my first WordCamp ever and had a really good time. It definitely was an eye opener. Finishing my thesis (and moving houses again! ), I was too busy looking around, so unfortunately I couldn’t attend any other Meetups after that, but I was determined to go to the next Dutch WordCamp. I started following their Twitter to stay updated. At some point I saw them mentioning a WordCamp Europe. By that time, I hadn’t really figured out this whole WordCamp thing (and certainly hadn’t realised the impact it would have on me later). But what? WordCamp Europe? Vienna? End of June? Well that would be a great graduation present after three years of hard work! So I bought myself a ticket. And started to look forward going to a lovely city. As the date got closer, I realised this was much bigger than I expected. Wow, are there really people flying in from all over the world to be here? So it’s not just a Europe-thing? I was getting more and more impressed (and excited) by the day. To have some pre-travelling fun, I started following the WordCamp Europe hashtag (#wceu) on Twitter. Soon, I found out there were all these warmup events and I hooked up with some Dutch WordPressers for a cycling trip through Vienna in the scorching heat. For three hours, we chased our guide Franz through Vienna and I had the best time of my life. Immediately I felt at home with this group that I had never met before, apart from speaking to one of them briefly on WordCamp Netherlands. Apparently they had done a bike tour in Sevilla the year before, and as real Dutchies, they thought to continue the tradition. For the next few days, we sort of met on and off, having dinner or drinks with other people they knew. I was impressed with WordCamp itself as well. I don’t think I’ve ever been to an event organised this well. The catering was great, the talks were great and the weather was perfect. The social on Saturday night was unforgettable. All volunteers were so dedicated and the atmosphere all through the event was the best ever. After returning I was so enthusiastic about being part of this, but it was difficult to describe how I really felt. I guess you have to be part of it to know what WordPress really is. Because WordPress in fact ís the community. I seriously doubt it would exist without the community. What I found truly amazing about it, is that there is so much respect. People make an effort to make the WordCamps accessible for everyone. Disabled, bad eyesight or hearing: WordCamps are accessible for wheelchairs, have live subtitles on the talks or someone who knows sign language. Children? Of course there’s a child care department, so parents can enjoy the talks as well. Crazy diets? Not one diet is too crazy for WordCamp. Event managers should definitely attend a WordCamp or sign up as a volunteer because they could learn a great deal. I love that the WordPress community wants everybody to feel welcome and included. And this is what I thought of when this remark of my teacher popped into my mind. Ever since I was a child, I have a great feeling for justice. I want people to be equal and not being judged on whatever. That’s my attitude he had problems with, because he thought I should adapt to what big bosses would tell me in life and that they would never accept the different opinion I had. Within the WordPress community, I feel that people live by this rule of justice (the code of conduct I think helps a great deal) and it goes without saying. I believe this is very very welcome in times like these and I feel happy that I’ve discovered the WordPress community. It really felt like coming home and meeting people on WordCamps help me keep faith in humanity. 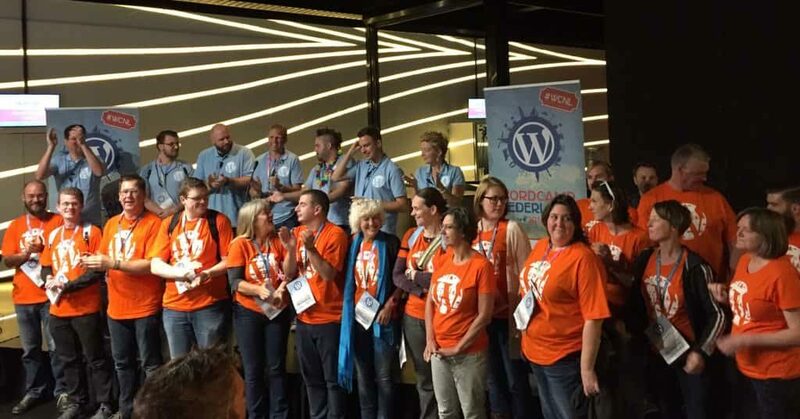 I went to the Dutch WordCamp last October, this time giving back a little bit by volunteering. And at the time of writing, I’m looking forward to my next WordCamp which will be in London from 17-19 March. It will be great to go to one of my favourite cities, but I’m excited to go to this WordCamp for more than one reason: I applied and got selected as as speaker! Not that I’m so keen on standing on that stage, but because it’s a great opportunity to for me to share knowledge and learn. Because that’s what WordCamps are for aren’t they? So this is a shout out to all WordPress newbies: get your arse over to the nearest WordCamp, you won’t regret it! We were all newbies once too, and we’re all still learning everyday and willing to teach you. We could probably learn from your expertise too! At the same time it’s a shout out to the WordPress community too: make it as easy as possible for new people to attend WordCamps. Invite them, buy tickets for them. Make them aware of the added value of the lively WordPress community both offline and online. Maybe it could become part of WordPress news in new installs? A link to all the great resources on WordPress.tv and support, and a notification of upcoming WordCamps? I definitely have intentions of visiting as many WordCamps as possible in the years coming, so hopefully I’ll meet you at one of them! The post Coming Home appeared first on HeroPress.